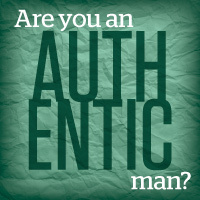 Are You an Authentic Man? So how about it—are you an authentic man? Really? When did that happen? When did you decide that you were a man? Who told you, and who gave you the rite of passage to manhood? Many cultures have clearly defined rites of passage to manhood. A ritual is observed—a celebration with the community, a mark on the forehead, or the fulfillment of a challenge confirms him. In Western culture when a boy becomes a man, we mark small rites, such as when a boy gets a driver’s license, is eligible for the military, or is old enough to purchase alcohol, but we do not have spiritual rites of passage into manhood. Marriage is considered by some to be the closest recognition of movement into manhood. The definition of manhood in our time is confused. When do we recognize a male as a man? Our sons step into manhood without fanfare or celebration. We don’t define it. We don’t have set principles that govern what authentic manhood is. We are witnessing the inevitable abuse of manhood. The last forty years has wreaked havoc on authentic manhood. The feminization of men is displayed in a constant barrage of media imagery. Almost every male represented on television is either a metro-sexual pretty boy or a slovenly buffoon. Every reality show has to have its token effeminate male. It’s embarrassing. This assault on authentic masculinity has a very broad impact. I won’t go through the barrage of statistics that support my claims; suffice it to say that the destruction of authentic manhood is having enormous repercussions on society. Some subcultures are already reeling from the loss of authentic man. Fatherless children are being raised with the insecurities that come from the loss of identity. Women are being left defenseless against the enmity that exists against them. The economic decline caused by the loss of male integrity is immeasurable. Boundaries are important. The foundation of manhood is being redefined. Unless we know why the male is a man, or what man is assigned to do or become, we will live abusive lives. We may abuse our own bodies with addictions such as alcohol, drugs, or food. We may abuse ourselves sexually and experience the degradation of our bodies through STDs or AIDS. The frustrations of unknown purpose may cause us to abuse our wives and misunderstand the true value of the male/female relationship. Extremes take over. We will either become obsessive chauvinists or emasculated weaklings. But to discover purpose, you simply need to look at original intent. Why did God create man? This article is an excerpt from the book Fivestarman—The Five Passions of Authentic Manhood by Neil Kennedy. To learn more about Fivestarman or to order your copy of Fivestarman—The Five Passions of Authentic Manhood please visit www.fivestarman.com. You are free and welcome to re-publish, re-post, and in general share this article with any and all, so long as you keep all credits and links intact. For reprint rights, please contact us at [email protected].